I'm generally averse to sequels. Back when I taught 7th grade, it never failed that, upon finishing reading Lois Lowry's "The Giver," a novel known for its brilliantly ambiguous ending, some kids would basically attack me with...BUT WHAT HAPPENS??? You'd think their little lives are over, and I'm all like, "Come on, guys. Not everything needs to be wrapped up nice and tight. Not every story needs to continue. We get to imagine its continuance, and that's better as far as I'm concerned." They don't buy it. Why would they? They have been raised in Hollywood's Rehash Age, a diabolical capitalist scheme to continue to take money from teenagers fueled by their nostalgia-riddled parents. It shows no sign of stopping, and I'm gonna be straight: I'm not as cynical about this as I seem. The nostalgia things works for me sometimes. And there are some characters I love so much that I would watch any new story their makers have to tell, even if, in one case, I didn't even know it. It's Long-Awaited Sequels this week as part of Wandering through the Shelves' Thursday Movies Picks. Released 12 years after Kevin Smith's groundbreaking Gen-X indie about a convenience store clerk and his video store clerk buddy doing more complaining and procrastinating than working, Clerks 2 is actually the funnier film, complete with callback and in-jokes to be sure but also adding a meta quality of having these great characters we literally haven't seen in 12 years realizing that time has passed, jobs change (they now work at a fast food restaurant), and that sequels always get made. Then, there are new characters, including two co-workers, the hot one played by Rosario Dawson and the naive, Christian gentlemen and his friends "Pillowpants" and "Listerfiend." Released 19 years after the original trilogy ended, the fourth Indy movie finds Steven Spielberg back at the helm one more time with what amounts to one of the great blockbuster blasts of my life. I never quite understood why people got so pissy at the craziness of this film, which finds our greatest movie badass hero, the greatest character Harrison Ford ever played, seeking a lost city of riches housing the "crystal skulls" of ancient alien beings alongside Marion Ravenwood (Karen Allen returns!! ), her son Mutt, the greaser (Shia LeBeouf), and their mentor, Harold Oxley (a hilarious John Hurt). Crazy right? Just about as crazy as Nazis' faces melting off, a scary Indian cult lord ripping a man's still-beating heart out of his chest, and actually finding the Holy Grail. Get over yourselves! This movie is easily as fun and nuts as the others and plays like one beat for beat. I put the opening sequence right up there with Raiders. And FYI, the CGI looks sort of bad...(Hot Take Alert!) on purpose. Released nearly 40 years after the original Rocky, it was Ryan Coogler's Creed that actually introduced me to the series. Yes. It was after I saw this 2015 powerhouse of a film that I finally sat down to watch the original. I had, of course, seen so many bits and pieces of all the Rocky films that I knew Stallone's greatest creation pretty well. But this film, one that picks up years after the events of what seemed to be the last one, Rocky Balboa (2006), offers the story of the long lost son of Apollo Creed, who tragically passed away in Rocky IV. Played by Michael B. Jordan, Adonis Creed needs to make something of himself for himself, and there is nobody better at that than Rocky Balboa, played by a Stallone we had all but forgotten. I cried many times watching this film, and I loved those tears. This is how sequels should be made always. I've caught up with several Brad Bird re-watches lately, including his other Pixar work: The Incredibles and the superior Ratatouille. I literally can't wait to get out of the house for this one. David Gordon Green directing a true Halloween sequel (one that forgets all the other sequels in between) from a script co-written by Danny McBride and starring Jamie Lee Curtis. IN! Nice picks! I enjoyed Clerks 2 quite a bit, it made me laugh. I didn't care for Crystal Skull or Creed all that much, but Creed at least was very well made. Incredibles 2 is decent, and I'll definitely be checking out that Halloween movie too! Thanks! Really looking forward to that Halloween. Thank you for saying Clerks 2 is the funnier movie. I wholeheartedly agree. And Creed is amazing. I don't hate Crystal Skull the way others do, but it is my least favorite of the franchise. It does have some fun moments, though. The original Clerks is a special movie. I love it. Clerks 2 is unreal funny. Crystal Skull is easily the weakest....yet as watchable as action movies get. Spielberg just has it. I didn't mind Indiana Jones and the Kingdom of the Crystal Skull. 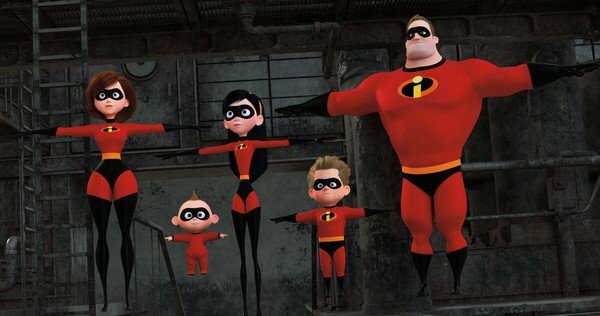 I can't wait to see Incredibles 2! Clerks 2 is the funnier film, although I think Clerks is the better film. Haven't seen Indiana Jones & the Kingdom of the Crystal Skull. Creed was great. Incredibles 2 was great. And I can't wait for Halloween (especially because David Gordon Green is behind the camera). My only pick for this is Blade Runner 2049. I think Clerks is definitely better just because its so raw. Stop what you're doing and watch EVERY Indiana Jones movie NOW, young man! I'm totally in for the new Halloween as well. It's such an audacious choice to ignore all the sequels and create something (somewhat) new. Really excited for that one. No doubt. It's gonna be something if nothing else.